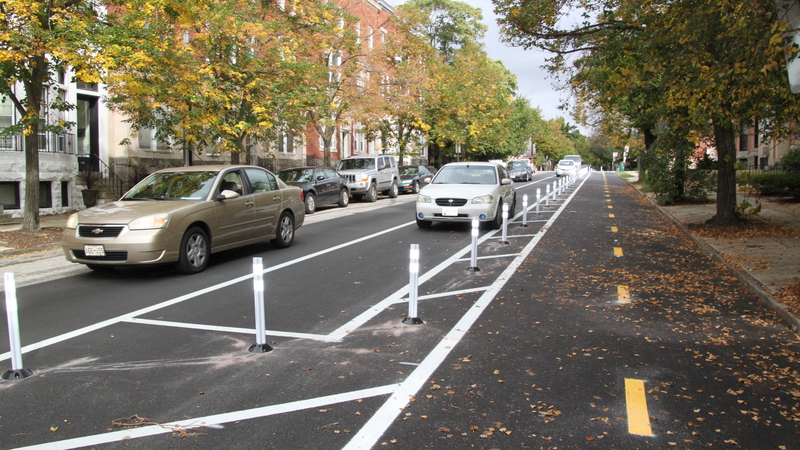 Workers haven’t quite finished spray-painting the lines and planting the white “flex-posts” in the roadway, but the Maryland Avenue Cycle Track has already sent a thrill through the biking community and attracted a steady stream of early adopters over the weekend. The two-way, north-south lane on the east side of the road, protected from moving traffic by a line of parked cars, was long sought by advocates who say Baltimore’s bike infrastructure lags behind that of other cities. 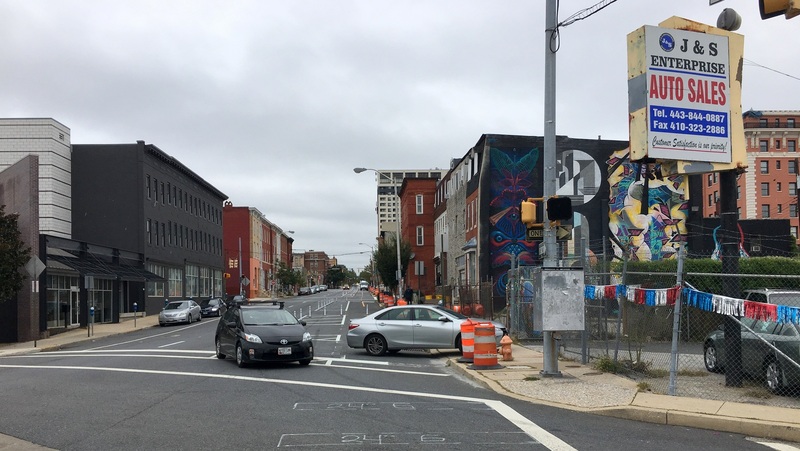 The new cycle track – to stretch 2.6 miles from 29th Street to Pratt Street – is meant to safeguard cyclists, encourage hesitant would-be bikers to get out of their cars and bring Baltimore in line with more “bike-friendly” cities. Bogged down by years of bureaucratic delay, it should be completed by the end of the month, city transportation officials say. Dewitt said he is hoping the new lane can be a better north-south route for him between his home in Charles Village and his downtown job. Members of her organization – “Should we throw a party?” one asked online – are clearly excited and eager for final fixes to be made. Over the weekend, Cornish herself was out clipping some of the tree branches drooping over the northbound side of the lane. Amid the high-fives, there have also been complaints about the new track, which eliminates one of two vehicular traffic lanes and, according to Department of Transportation spokeswoman Adrienne Barnes, as many as 25 parking places. Meg Fairfax Fielding, who owns buildings on Maryland Avenue between Preston and Biddle, said property owners were not notified or consulted and that a lack of signage at this point makes the cycle track confusing and dangerous for motorists and bike riders. Fielding said the city’s estimate for lost parking spaces sounds low. “It looks like six are being eliminated on our block alone,” she said. Facing north on Maryland Avenue – a one-way southbound street that will have bikes traveling north and south. (Fern Shen). James D. Dilts said he’s been driving and riding a bike in Baltimore for 50 years and, for both modes, has always preferred less-busy Maryland Avenue. 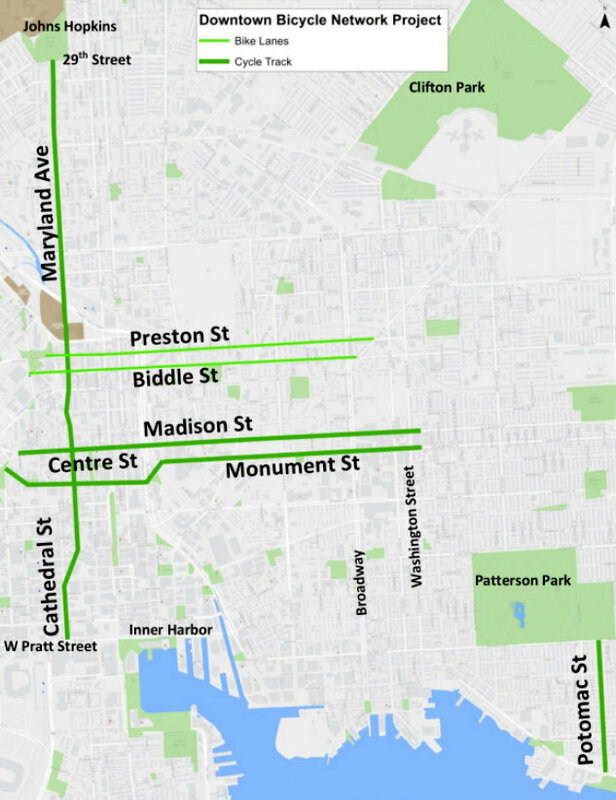 Those older style bike lanes are being connected with the new Maryland Avenue bike lane as part of a broader blueprint: the Baltimore Downtown Bicycle Network. The Board of Estimates approved $300,000 for the network in July. 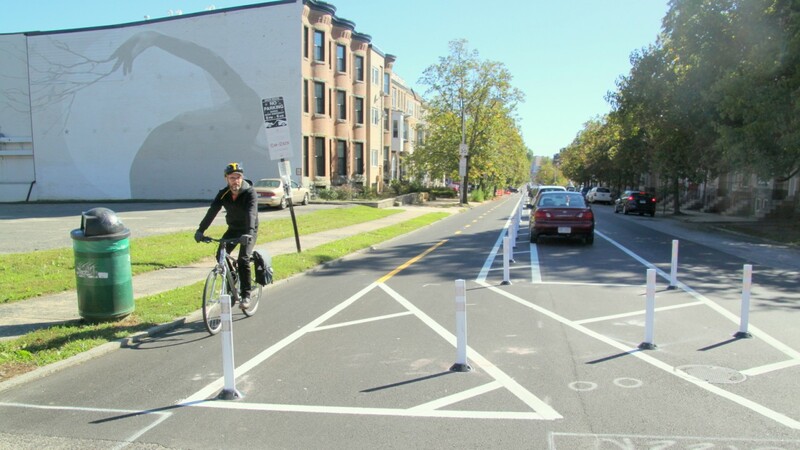 That spending includes $240,000 for Toole Design Group to create the Maryland Avenue Cycle Track and five connecting east-west lanes on Centre, Monument, Madison, Preston and Biddle streets. The board also approved $52,000 for consultants McCormick Taylor to complete other work on the network. The entire Downtown Bicycle Network Project, much of it covered by state and federal funding, was bid on at $2,849,822 by P. Flanigan & Sons, Inc., Barnes said. Of that total about $700,000 was for the Maryland Avenue portion. Commenting on some of the early critiques of the new Maryland Avenue lane, Cornish said delays in implementation of the project over years probably contributed to the impression some had that they weren’t notified. She said improvements still to come along Maryland Avenue as workers wrap up – signage, striping on the road surface, replacement of bike-tire-grabbing grates – will iron out early problems and make for a positive experience for cyclists, drivers and the public in general. She acknowledged another issue – bike infrastructure equity – can’t be so easily addressed. Lawrence Brown, a professor at Morgan State University, has launched a blistering critique of Baltimore’s transportation priorities. 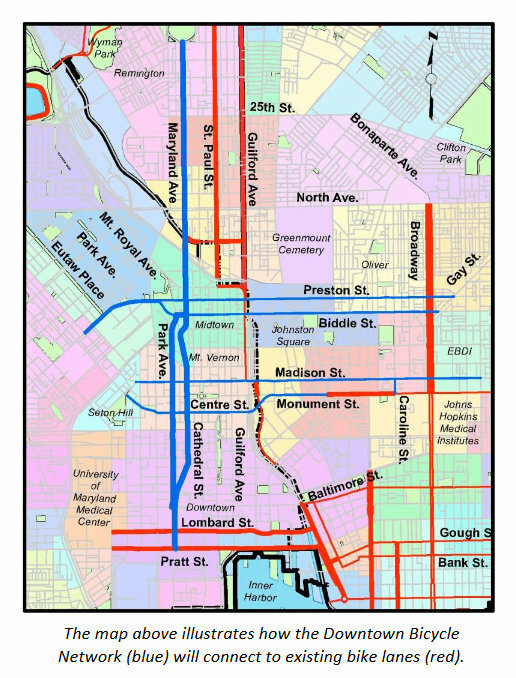 A map of the bike lane routes (as well as Bikeshare stations and the free Charm City Circulator buses) largely coincides with the more white and affluent parts of highly segregated Baltimore, he points out. “As you can see, the main artery runs north-south in the conventional White L,” he writes on his Baltimore Redevelopment Action Coalition for Empowerment (BRACE) Facebook page. Brown said his group suggested having bike lanes run from Sandtown-Winchester to Port Covington or from other Black neighborhoods to future job opportunities in that planned waterfront development. Speaking with The Brew, Cornish said Bikemore is reaching out to disinvested communities that haven’t had bike infrastructure to empower them to advocate for it.